Northside Health Center is in north central Houston, North of North Loop. Between the Hardy Toll Road and the Eastex Freeway U.S. 59. Consentimiento de los padres no es necesario para los servicios de planificación familiar para adolescents. Note: Center closed on Saturday and Sunday. Patients age 18 and younger, may be eligible for the Texas Vaccines for Children (TFVC) Program. Patients age 19 and older, may be eligible for the Adult Safety Net (ASN) Program. 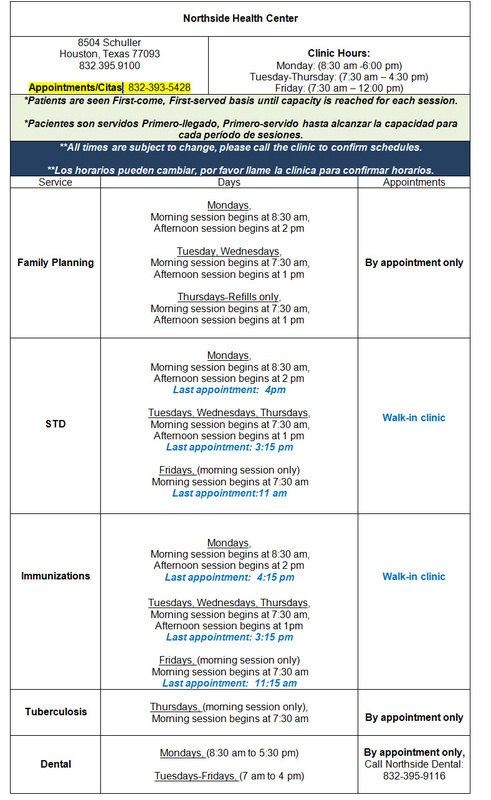 “STD and Immunization is a Walk-in service base on the quota for each session and a quota is set for each session." Appointments are only in the morning. Call in advance for an appointment 832-393-5428. Monday & Wednesday By Appointment Only. Services for children and Adults 12:00-4:30pm. Call in advance for an appointment 713-696-5928. First Thursday of the Month Only By Appointment Only. Call in advance for an appointment at 832.393.4804 or 832.393.4799. Project Valet –M.D. Anderson Cancer Center & Houston Health Department are working together to bring mammograms screening and education to Northside Community. For an appointment or more information call: 832-393-5428.